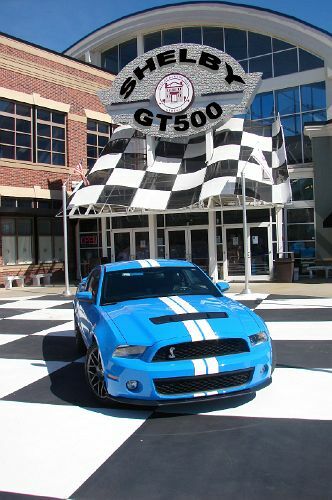 2011 Shelby GT500 Mustang with the Special Vehicle Team performance package presented by the Ford Motor Company and the Carroll Shelby team. An outstanding and groundpounding, fire breathing, boulevard cruiser with all the horsepower and torque that anyone could ask for. This is technically a brand new car with almost every major component having been redesigned. The main thrust of the redesign was to apply the latest technology to reduce weight and meet the emissions and fuel regulations. They have achieved success on all counts and in the process have made a fully streetable, 550 horsepower, fire breathing ball of fire. People thought I was crazy driving that thing up unto the front entrance to what is now the City Hall of Dawsonville, GA. The security guard came out and I explained what I was doing and he cooperated all the way. He said his family was in racing in the old days and he was in shock when I gave him a ride in it. I asked if he would get in trouble and he said he didn't care, he wanted to ride in that ''thang''. The Ford V8 has always been the leader in speed and here at the former old Thunder Road Museum in Dawsonville, GA, we have the very latest from Ford Motor Company.